Location: Kiten sea resort is situated on the South-eastern Bulgarian seaside coast, 55 kilometers away from Bourgas and just five kilometers south of Primorsko. Kiten is amongst the most attractive sites on the southern Black sea coast, where the forestry Strandja spurs are reflecting in the crystal clear sea debris. 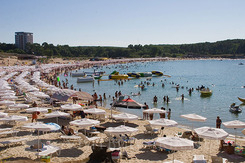 The two local beaches are real paradise for holidaymakers. Fine golden sands, warm sun and calm sea offer great opportunity for a perfect holiday away of the bustling big resources. The northern beach is very attractive for its beautiful sand dunes. Fun & Entertainment: Kiten offers different kinds of water sports- yachting, underwater- fishing, water diving, water ski and etc. It also offers a football playground, tennis courts, basketball and volleyball playground, swimming pools, banana and etc. Wine & Dine: Tourist can enjoy the numerous choices of local restaurants and taverns. Almost every hotel has its own inside saloon and a summer garden restaurants. 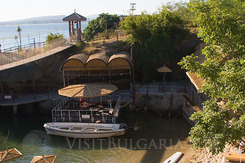 Most of the restaurants offer traditional Bulgarian cuisine, fish and sea delicacies, barbeque grill. Life music or additional attraction is a common service in the restaurants. Those who want to experience wild night life can make their choice of party in one of the numerous night clubs and discos in the town.